Marking its 50th anniversary in 2007, the Monterey Jazz Festival is one of the longest running events of its kind with a notable history in which everyone who's everyone in the jazz world has made an appearance. The event was the brainchild of its co-founders Jimmy Lyons, San Francisco-based radio disc jockey, and Ralph Gleason, and debuted in 1958 with the likes of Dizzy Gillespie, Louis Armstrong, Shelly Manne, Gerry Mulligan, Art Farmer, Harry James, Max Roach and Billie Holiday. The festival, which takes place at the Monterey Fairgrounds, has grown over the years to showcase music on nine stages. It also offers panel discussions; workshops; exhibitions; clinics; and a myriad of food, shopping and activities scattered throughout the 20-acre space. This year, a piece of the festival will come to fans across the country in the form of a touring group, featuring trumpeter Terence Blanchard, saxophonist James Moody, vocalist Nnenna Freelon, pianist Benny Green, bassist Derrick Hodge and drummer Kendrick Scott. The tour commences in early January with dates in 52 cities in 22 states, including a stop at UCLA's Royce Hall Jan. 18, and commemorates an event synonymous with historic jazz performances, which this September, drew 45,000 fans with all three days sold out, setting a record. Even the band that will take a piece of the event on the road has strong connections to the festival. Moody's first appearance occurred in the 1960s with Gillespie, Freelon has performed at the festival since the mid-1990s, Blanchard was named the festival's artist-in-residence in 2007 and Green was a student in the event's educational programs during the 1970s. The Beach Reporter sat down with Blanchard to talk about the tour and his latest album on the Blue Note label entitled “A Tale of God's Will: A Requiem for Katrina” in which some of the music was taken from his score for Lee's HBO documentary “When the Levees Broke: A Requiem in Four Acts.” Blanchard was actually interviewed for the documentary, which includes footage of him accompanying his mother back to her broken and battered home in the post-Katrina New Orleans. Blanchard still resides in the birthplace of jazz, and has been living there since early 2006. The Beach Reporter: Being a son of New Orleans and as part of Spike Lee's documentary, did you find writing the score, which part of it later became your album, difficult because it was about something so personal? 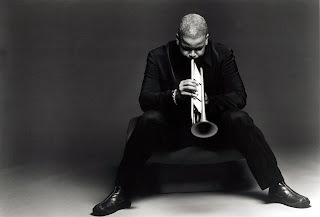 Terence Blanchard: Yeah it was hard to write. It was hard to write because - how do I say this? - musically I wanted to make a strong statement, but at the same time I didn't want to get into crowding the stories so I had to find a balance between writing something that was melodic and poignant but also writing it in such a way where it would still give room for all of those narratives to be heard. Some of the members of your band wrote some of the songs for the album. Was this a collaborative effort? Well, firstly, it's not the first time that these guys have written music for any of our albums. I've always tried to encourage that with these guys because they are great writers. The thing that was amazing was that they were writing music about the aftermath of Katrina at the same time that I was, unbeknownst to me. When did you begin writing the music for the documentary? Well, we were working on the music to the ‘Inside Man,' actually, when I was interviewed for the documentary so musically, my mind was someplace else. It wasn't until Spike had the first two hours of the documentary cut together that he brought it to me and I started to come up with the music for the documentary. It was some time after that, after we finished the score, that I even thought about doing the album, and doing the arrangements for the album, which are very different from the score. What is your approach to writing a score? Well, you obviously have to watch the film first or actually read the script before you see the film to get a sense of it, and have a conversation with the director so you kind of know what the director's looking for. Then just proceed accordingly. I think with any film score I've done, it's very important to have those close working relationships with the directors because we all have varying opinions about anything and impressions about anything. I can always take any story and go into any direction so I always make sure I get a sense of what the director is looking for. Tell me a bit about the Monterey Jazz Festival tour. It was a great honor to be asked to be the artist-in-residence this past summer, to be a part of that festival, given its 50th anniversary. Then Tim Jackson (the festival's general manager) talked to me about putting together a group to take on the road. We actually put on a couple of concerts at the festival and they went well, and now we are just looking forward to going on the road and doing our thing.